Gently soothes a sore throat and colds and flu symptoms. When you start to get a sore, irritated or scratchy throat, it often means that a cold or flu is on its way. You need something that can relieve the symptoms and help to prevent them from getting worse. 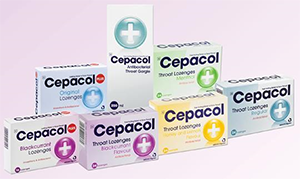 Cepacol's anti-bacterial formulations offer soothing relief from sore throats caused by the onset of colds or flu. Indication Symptomatic relief of sore throat.